Navy yard shootings: Federal employees and contractors were the victims. Nobody from “This Town” ever met the victims of Monday’s Navy yard shooting. That’s a shame. 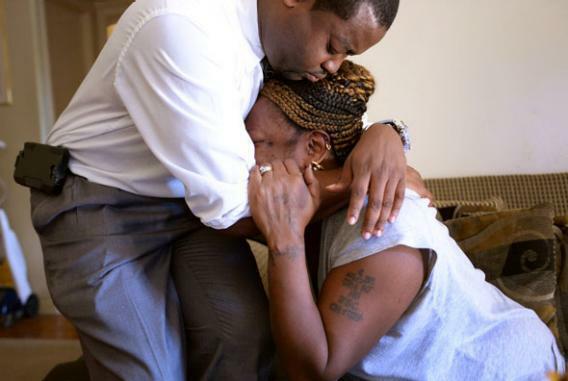 Priscilla Daniels, wife of Arthur Daniels, who was killed in the rampage at the Navy Yard Monday, is comforted by Lynnell Humphrey of Constituent Services. This essay is reprinted with permission from John Feehery’s blog, The Feehery Theory. Mark Leibovich wrote This Town, a memorable book about official Washington, its fancy parties, its self-absorbed culture, the incestuous nature of lobbyists, journalists, pundits, strategists, party planners, and socialites. But there’s a whole other town out there, right under the nose of This Town, and you could see the face of that town in the obituaries of those who died on Monday. Twelve people were gunned down at the Naval Yard, and I can pretty much guarantee that nobody from This Town had ever met them. There are plenty of people in this other town in the Washington, D.C. metro area. Some serve at the Navy Yard, some at the Pentagon, some the Geospatial Agency, some at the Departments of Agriculture, Labor, Health and Human Services, and various other government agencies. The people for this other town commute in from distant places like Woodbridge and Waldorf, Rockville, or PG County. They take the Metro, or the VRE or the MARC, or they catch the bus, or they slug their way in. By slug, I mean they basically hitchhike (in an organized fashion, of course), by jumping in other people’s cars at specific points on the highway, which allows the drivers to drive on the HOV lanes. It’s an ingenious system, mostly done organically. That’s what folks do in this other town to get into work. These folks work in the Federal government because it is good steady work and the benefits are pretty good, and they like what they do. Some are stirred by patriotism to serve their country in the military, while others like working in fields like health policy or with agriculture programs. Folks in this other town don’t get to decide whether the government shuts down or not, although if they are deemed nonessential personnel, they don’t work on those days that the government does shut down. Many of these people in this other town got hit hard with the sequester. Some had to take unpaid days off because they were furloughed, all because the Congress decided that cutting discretionary spending was far easier than cutting entitlement spending. Because so many of these folks in this other town live in the suburbs, and because many of the housing prices in those suburbs crashed so substantially, it would be pretty fair to say that they have a better understanding of what the rest of America has been going through than the denizens of This Town. The 12 who died in Monday’s attack pretty much typified this other town. They ranged in ages from 46 to 73. They mostly liked what they did for a living. Only one lived in the District of Columbia. Most had pretty long commutes into work that morning. They were a racially diverse group and they did all kinds of different things to help make the Navy run. Some were contractors, others were civilian employees, some were still in the Navy. One of the victims had served as president of the local Rotary Club. Another coached the local girls Jaycees softball team. One was an immigrant from India who had lived the American dream. Some had already been marked by tragedy. One victim had a son who had been shot dead in the back years earlier. Another’s house had burned down and had to start from scratch. None of them really thought that when they woke up that fateful Monday morning that it would be their last. They worked for the Navy, but they weren’t on the front lines of whatever war we might be fighting at the moment. Official Washington, the folks from This Town, have already moved on to the next thing. To them, like the various other needless and senseless violent gun attacks that have befallen the country, this is just another example of how tragedy hits folks outside the bubble. To the folks in This Town, this might have happened almost anywhere else in America, but it happened surreally in their back yard, to people they didn’t really know, but had probably run across in their daily travels. The folks in this other town, as exemplified by those who died on Monday, are not so different than people in the rest of the country. They live for their families and they are doing the best that they can to make it through every day. Some people like to rail against Washington and Washington bureaucrats, but those folks who live in this other town aren’t getting rich at the expense of the taxpayers. They are trying to do their jobs the best they can, and they provide an essential role in the running of our federal government.